A group of Illinois Republican lawmakers are taking action in the wake of the recent investigative report detailing the troubling situation surrounding the high-paid corrections employee with a history of gang membership and falsified job qualifications spanning multiple state agencies. 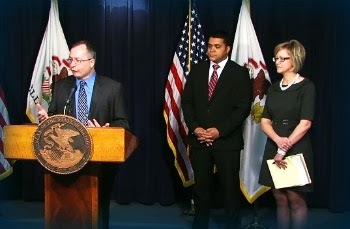 The trio, including State Rep. Dennis Reboletti (R-Elmhurst), State Rep. John Anthony (R-Morris) and State Rep. Jeanne Ives (R-Wheaton), is seeking a legislative remedy for the future and a potential investigation into the apparent gross lapses in employment standards within the Illinois Department of Corrections. The situation as detailed by the Chicago Sun Times last week revealed Xandrian McCraven, a former Chicago gang member with political ties was found to have bounced between several high paying jobs with the Illinois Department of Children and Family Services (DCFS) and the Illinois Department of Corrections (IDOC) despite major problems with his background including involvement as a former gang member with over 24 arrests and three convictions ranging from illegal handgun possession to disorderly conduct. Most recently, McCraven was employed as a senior advisor to the IDOC Chief of Parole at a salary of $111,432 a year. Like Rep. Reboletti, former police officer Rep. Anthony was questioning how a former gang member with such a questionable record was given so many chances at high paying positions within the IDOC. Rep. Reboletti and Rep. Anthony are seeking a legislative initiative aimed at barring gang members from employment by state law enforcement agencies and agencies that supervise children. Under their proposal, a person who is documented to have been a member of a criminal gang would be prohibited from employment by the Illinois Department of Corrections, the Illinois State Police, the Illinois Department of Juvenile Justice and the Illinois Department of Children and Family Services. For the prohibition to apply, there would have to be documentary evidence that he or she was a member of a criminal street gang, including a gang related conviction of gang-related offense or finding of fact by a court and would apply to all hiring by agencies including unionized and political hires. Similarly, Rep. Ives is looking to address the situation in a broader sense with a proposal prohibiting a person with two or more criminal convictions from holding employment with the State of Illinois. Under her proposal, a person who has been convicted two or more times of criminal offenses including a felony, class A Misdemeanor or a DUI would be ineligible to be employed in any position by the State of Illinois. While it would exempt certain traffic violations and smaller class misdemeanors, the prohibition would apply prospectively to all state hiring including unionized, political, legislative and judicial employees. All three lawmakers indicated that they were going to explore the option of calling for legislative hearings into exactly how this individual was able to repeatedly obtain these positions despite being relieved from his duties at each assignment.